There are times in life when I seek solace from a harsh world purely through the means of butter, cream, and starch. Sometimes nothing else will do. It’s times like these when I just want to retreat into my shell, put on my fuzziest slippers and softest, most lived-in robe, and putter around the kitchen making something warm and soul-soothing. As clichéd as that sounds, it really is one of my guiltiest and most savored pleasures, and my preferred method of restoring balance and calm to my hectic life. There’s something about a simmering pot on the stove that makes me feel all is right with the world. Especially when the end result is a big bowl of Hearty Winter Chili, topped with cheese and sour cream and accompanied by warm, tender corn bread, cooked the old-fashioned way in a cast-iron skillet. When I’m feeling particularly out-of-sorts, I find the meditative repetition of stirring a pan of Saffron Risotto for 20 minutes - the only way to achieve that melting creaminess - an almost Zen-like experience. Top it with juicy grilled shrimp and the dish becomes transcendent! When I crave something just a little more exotic and worldly, but no less warming and gratifying, it has to be Indian Coconut-Chicken Curry, spiked with coriander, cumin, and creamy coconut milk. This dish can be made in minutes and tastes even better reheated the next day. And of course, for many, the ultimate comfort food comes in the form of chocolate. Old-Fashioned Whoopie Pies have been a favorite of mine since childhood, and these dense chocolate cakes sandwiching a billowy layer of marshmallow cream are the ultimate sinful indulgence. So the next time you need a break from the world, or just need to indulge in a little guilty pleasure of your own, you just may find it in a bowl of something warm and comforting made in your own kitchen. Lived-in robe and fuzzy slippers optional. In a large stock pot or Dutch oven over medium-high heat, add olive oil followed by ground sirloin. Season meat with chili powder, grill seasoning, cumin, Worcestershire, and hot sauce. Break up the meat into small crumbles as it cooks. Add onion, garlic, and bell peppers and cook until onions are translucent and soft, about 10 minutes more. Add beer and deglaze the pan, scraping up the browned bits from the bottom of the pan and allowing the alcohol to cook off. Add tomato and barbecue sauces and bring to a bubble. Let chili simmer 15 minutes. Adjust seasonings and heat level to your taste. Remove from heat and serve with your favorite garnishes. In a large mixing bowl, whisk together cornmeal, flour, baking powder, baking soda, sugar, and salt. In a small bowl, whisk together melted butter, buttermilk, eggs, and corn, and fold into the dry ingredients, stirring until just combined. Over high heat, add oil to cast iron skillet and heat until smoking. 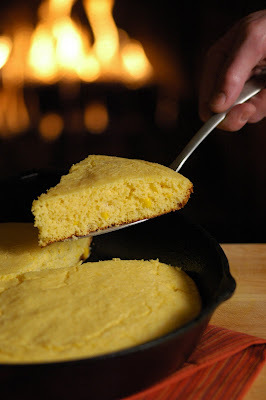 Quickly pour batter into the hot skillet and carefully and quickly transfer the skillet to the preheated oven. Bake for 10 to15 minutes, or until corn bread is golden-brown around the edges and a toothpick inserted in the center comes out clean. The top should spring back when lightly pressed. Cut into wedges and serve slathered with honey butter. In a Dutch oven or enameled cast-iron casserole, heat oil, then add onion and cook until nicely browned around the edges, about 7 minutes. Add garlic and ginger and cook for 1 minute. Add coriander, cumin, turmeric, cayenne, and black pepper and stir for 1 minute. Add salt, tomatoes, and chicken stock and cook over medium-low heat, stirring constantly, until the tomatoes are softened. Add chicken and simmer uncovered, stirring occasionally, for 15 minutes. Add coconut milk and simmer partially covered for another 15 minutes, or until the sauce thickens and the chicken is cooked. Add cinnamon and cloves and simmer another minute. Remove from heat and garnish with cilantro. Serve with steamed basmati rice. Preheat outdoor grill or indoor grill pan over high heat. Heat chicken stock over medium-high heat until just below the boil. In a large sauté pan, heat 2 Tbsp. olive oil and 2 Tbsp. butter over medium heat. Add shallots and garlic and sweat until translucent, stirring constantly, about 3 minutes. Add rice and saffron, turning to coat, and sauté until the edges of the rice begin to look slightly translucent, about 2 minutes. Add wine and cook until most of the liquid is absorbed and the pan is almost dry. Add one ladleful of hot stock, stirring constantly until liquid is almost absorbed. Continue adding stock, one ladle at a time, stirring each addition until the liquid is almost absorbed, about 22 to 25 minutes total. Stir in remaining butter and cheese and season with salt and pepper; cover. Toss shrimp with remaining oil and season with salt and pepper. Grill shrimp until pink, opaque, and curled in on themselves, about 2 minutes per side. Spritz shrimp with lemon juice and parsley and serve over risotto. Line two sheet pans with parchment paper. In a small bowl, whisk together flour, cocoa powder, baking soda, and salt. In another small bowl, stir together buttermilk and 1 tsp. vanilla. In a standing mixer fitted with a paddle attachment, cream together 1/2 cup butter and brown sugar until light and fluffy, about 3 minutes. Add egg, scraping down the sides of the bowl to combine. Reduce mixer speed to low and alternately mix in dry ingredients and buttermilk mixture in batches, beginning and ending with flour. Scrape down side of bowl occasionally and mix until smooth. Using a 1/4-cup ice cream scoop, drop mounds of batter about 2 inches apart on prepared sheet pans. Bake in upper and lower thirds of oven, switching position of sheets halfway through baking, until tops are puffed and cakes spring back when touched, 12–13 minutes. Transfer cakes to a rack to cool completely. To make the filling, cream together remaining butter and confectioners’ sugar until light and fluffy, about 3 minutes. Add vanilla and marshmallow fluff and continue beating until smooth and light, about 2 more minutes. To assemble the pies, dollop a rounded tablespoon of filling on flat sides of half of cakes and top with remaining cakes.